Abstract: This paper outlines the Independent Core Observer Model (ICOM) Theory of Consciousness defined as a computational model of consciousness that is objectively measurable and an abstraction produced by a mathematical model where the subjective experience of the system is only subjective from the point of view of the abstracted logical core or conscious part of the system where it is modeled in the core of the system objectively. Given the lack of agreed-upon definitions around consciousness theory, this paper sets precise definitions designed to act as a foundation or baseline for additional theoretical and real-world research in ICOM based AGI (Artificial General Intelligence) systems that can have qualia measured objectively. 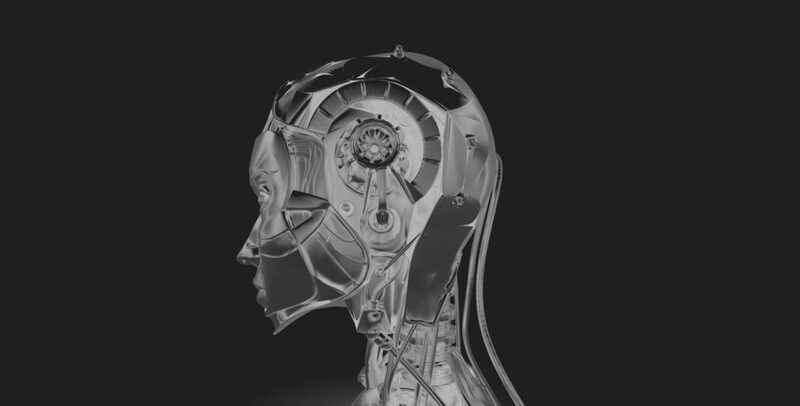 The Independent Core Observer Model Theory of Consciousness is partially built on the Computational Theory of Mind (Rescorla 2016) where one of the core issues with research into artificial general intelligence (AGI) is the absence of objective measurements and data as they are ambiguous given the lack of agreed-upon objective measures of consciousness (Seth 2007). To continue serious work in the field we need to be able to measure consciousness in a consistent way that is not presupposing different theories of the nature of consciousness (Dienes and Seth 2012) and further not dependent on various ways of measuring biological systems (Dienes and Seth 2010) but focused on the elements of a conscious mind in the abstract. With the more nebulous Computational Theory of Mind, research into the human brain does show some underlying evidence. Qualia typically is considered the internal subjective component of perceptions, arising from the stimulation of the senses by phenomena (Gregory 2004), given the assumption of a version of the computational model of consciousness and the fact that data from sensory input can be tracked in a human brain we are assuming that qualia as “raw experience” is the subjective conscious experience of that input. From the standpoint of the conscious mind qualia is the subjective experience that can be measured external to the system if the mind in question is operating under known parameters we can tap into for example in systems using the ICOM Theory of Consciousness as it can be objectively measured. Humans are not able to make logical decisions. Looking at the neuroscience behind decisions we already can prove that humans make decisions based on how they feel (Camp 2016) and not based on logic. We are assuming researchers like Jim Camp or Antonio Damasio are accurate at least at a high level with the empirical evidence of their work implying that humans do not make ‘logical’ decisions. This is important when looking at how consciousness works in that it appears not to be based on logical but on subjective emotional experience and that is the assumption that this research will continue to bear out with the current empirical evidence already supporting it. Subjective experience can be measured and understood. The traditional view that the subjective nature of experience (Leahu, Schwenk and Sengers 2016) is purely subjective is rejected as a matter of principle in this paper. All things can be objectively broken down and understood theoretically, and the use of things being subjective is more indicative of an excuse for not being able to objectively quantify something ‘yet.’ Consciousness, even by scientists in the field, frequently consider it the realm of “ontology and therefore philosophy and religion” (Kurzweil 2001) our assumption is that this is false and we reject it as stated earlier as a lack of understanding and/or insufficient data and/or technology. Consciousness can be measured. To quote Overgaard; “Human Consciousness … has long been considered as inaccessible to a scientific approach” and “Despite this enormous commitment to the study of consciousness on the part of cognitive scientist covering philosophical, psychological, neuroscientific and modeling approaches, as of now no stable models or strategies for the adequate study of consciousness have emerged.” (Overgaard 2010) That is until now with the ICOM theory and our approach to measuring consciousness based on the Porter method (Porter 2016) and which while has elements of subjectivity, it is a qualitative approach that can objectively be used to measure degrees of consciousness. As to the specific points of the Porter method, we also believe that we can measure consciousness regarding task accuracy and awareness as a function of stimulus intensity (Sandberg, Bibby, Timmermans, Cleermans and Overgaard 2011) that applies to brain neurochemistry as much as the subjective experience from the point of view of systems like ICOM based on the Porter method. To be clear there are subjective problems with the Porter method however to the extent that we are focused on “if a system has internal subjective experience and consciousness” the Porter method can help us measure the degree in which that system has those subjective conscious experiences and thus help “enumerate and elucidate the features that come together to form the colloquial notion of consciousness, with the understanding that this is only one subjective opinion on the nature of subjective-ness itself” (Porter 2016) being measured objectively using those subjective points. We have a concrete definition of ‘Subjective’ as a concept. To be able to make progress in building and designing a system with a “subjective internal experience” we need a way of defining ‘subjective’ such that it can be objectively measured. ‘Subjective’ then is defined as the relative experience of a conscious point of view that can only be measured objectively from outside the system where the system in question experiences things ‘subjectively’ as they relate to that systems internal emotional context. Consciousness is a system that exhibits the degrees or elements of the Porter method for measuring consciousness regarding its internal subjective experience. (Porter 2016) While the dictionary might define consciousness subjectively in terms of being awake or aware of one’s surroundings (Merriam-Webster 2017) this is a subjective definition, and we need an ‘objective’ one to measure and thus the point we are assuming for the context of the ICOM theory of mind and the ICOM research altogether. According to CCTM, the mind is a computational system similar in important respects to a Turing machine, and core mental processes (e.g., reasoning, decision-making, and problem IST2017 solving) are computations similar in important respects to computations executed by a Turing machine (Rescorla 2016) – which can have numerous variations. An instance of an ICOM system would be a variation instance of CCTM. In addition to that, the ICOM Theory of Consciousness or ICOMTC also borrows from the Integrated Information Theory (Tononi, Albantakis and Masafumi 2014). CCTM does not give us a complete basis for developing ICOM systems and includes elements of Integrated Information Theory as well as CCTM. Integrated information theory or IIT, approaches the relationship between consciousness and its physical substrate by first identifying the fundamental properties of experience itself: existence, composition, information, integration, and exclusion. IIT then postulates that the physical substrate of consciousness must satisfy three key points or ‘Axioms’ (Tononi, Albantakis and Masafumi 2014). Integrated information theory phenomenological axioms are: 1. information says that each experience is specific – it is what it is by how it differs from alternative experiences. 2. integration says that it is unified – irreducible to non-interdependent components. 3. exclusion says that it has unique borders and a spatiotemporal grain. In IIT you can develop a mathematical framework in which composition, information, integration, and exclusion are defined precisely and made operational (Tononi, Albantakis and Masafumi 2014). IIT still doesn’t account for subjective experience and is specific to a substrate while ICOM based system would apply IIT an IIT based system is not necessarily able to have the emotional, subjective experience and quantify it in the same way we can with ICOMTC based systems which can be broken down where ICOMTC systems address objective measurement of subjectivity. ICOMTC also borrows from Global Workspace theory in that things move through the system and only when things reach a certain point is that bit of ‘thought’ or ‘context’ raised to the level of the conscious mind. (Baars and Katherine 2016) CCTM, IIT and Global Workspace all exist more or less in ICOMTC where ICOMTC based system exhibit all the elements of all of these theories to some degree but it is also substrate independent in that ICOMTC is not an attempt to produce the same kind of system as the biological substrate of the human brain or do anything that requires that kind of hardware nor is it tied to current computer architecture either other than any Turing machine (Wiki 2017) in theory would be able to run an ICOMTC based system given enough time. ICOMTC does not address those implementation details and is, therefore, substrate-independent in design and theory. At a very high level, ICOM as a cognitive architecture (Kelley 2016) works by streaming data and context processed by the underlying system (the observer) and based on emotional needs and interests and other factors in the system, these are weeded out until only a certain amount are processed, or ‘experienced’ in the ‘core’ (or global workspace) which holds emotional models based on Plutchik’s (Norwood 2016) work. These elements of the core exist for both conscious and subconscious emotional landscapes of the system where the context that is ‘experienced’ from the standpoint of the system is the only ‘experiences’ that the conscious system is aware of. In this way, only the differential experience matters and the system, for example, doesn’t understand a word as much as it feels the emotional context of the word as it relates to underlying context. It is the emotional valences associated with things that the system then selects things to think emotionally about. The system select’s actions based on how they improve the experiences of those emotional valences and in this way the system may choose to do something logical based on how it feels about it, or it could just as easily pick something else for no other reason than it feels a bit better about it. In this way, also the system does not have direct access to those emotional values nor is a direct function of the algorithms, but it is an abstraction of the system created by the core that can be considered emotionally conscious or self-aware being sapient and sentient in the abstract. How do we then look at a system that experiences emotional, subjective experience objectively? The following set notation shows us a simple logical implementation of the last climb of “a thought” as it makes its rise from the depths of the system to the awareness of the conscious, self-aware parts of the system. Figure 1: Core Logic Notation. First, let us walk through the execution of this logic. Coming into the system we already have context data decomposition, sensory input, also related data from memory that may be of emotional interest but for the purposes of one ‘thought’ let’s say it’s one bit of context meaning an emotionally related context tree related to something that the system has sensed externally. This will be represented by ‘Inputs.’ At this point, we have already passed the point of that ‘context’ being raised to the global workspace. Figure 1 essentially is one cycle of the core considering what is in the global workspace or ‘core’ of ICOM. 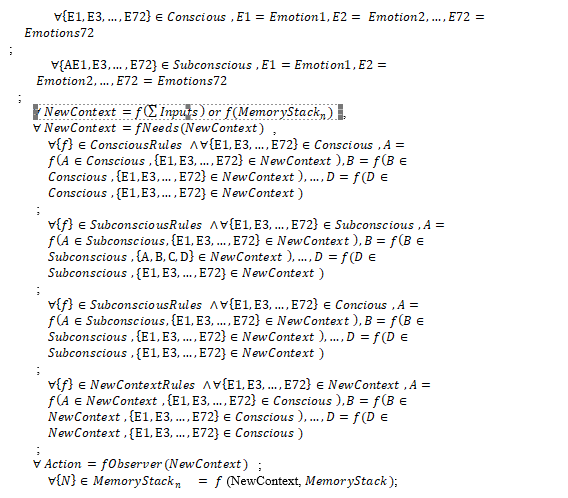 In Figure 1 we first see that we have two sets or collections of emotional models represented by the two sets defined in the first two rows, then we have the input new context placed in the ‘NewContext’ set. We apply the ‘Needs’ function that applies a matrix set of rules such as the technical requirements of the system to other wants and needs based on the systems hierarchy of needs and current environmental conditions. At this point, we look at how this thought applies conscious emotional rules in the function ‘ConsciousRules’ and then how that manipulates the current conscious emotional landscape. We say ‘landscape’ because it is not a single emotion but a complex set of almost infinite combinations consciously and subconsciously that the system experiences. In like manner, the system applies subconscious rules to the subconscious states and the subconscious rules to the conscious states and finally those states as they apply to the new context where in all cases it is only in the abstract from this states that the system experiences anything. Meaning the system is using the abstracted states to represent that emotional landscape in how things affect all of those emotional states and related context finally being passed to the observer for action if that ‘NewContext’ contained an action. In this way, the system doesn’t even deal with the complexity of its actions as much as the system will do them if the system felt like it and knows how; where as numerous cycles might have to execute in the core for it to perform a new task, meaning it will have to think a lot more about something it doesn’t know how to do. After that context is posted back to the observer (the more complex part of the system in ICOM), then it is placed back into context memory, and in this way, we see the rich set of the emotional landscape of the system is modeled and executed. Interestingly enough, in current ICOM research there are indications that this sort of system is perfectly capable of becoming mentally ill and even forgetful if hardware starts to limit operations, where as the only way to optimize for the execution environment would be to place memory limits and based on the node map memory models this would be the only way to continue optimal execution given certain limits. A better way to think of ICOMTC is that not a single element of the system is conscious or selfaware to any level, it is the ‘interactions’ between the parts that together those interactions become aware abstractly, and it is through the underlying process articulated in Figure 1 that is then measured in terms of consciousness via the Porter method mentioned earlier as well as direct instrumentation of the system to measure ‘qualia’ for example. In ICOMTC qualia can be objectively measured through the differential between the conscious emotional landscape of the system represented by a plutchik model along with the subconscious model and the model of the irreducible set of any given context experienced by the system and the emotional model created that represents that specific ‘contextual’ experience. In the ICOMTC the qualia is that differential between the state and effective one emotional structure that represents that current context and how the system applies choices is then based on that and the numerous underlying factors that affect the construction and choices based on specific contexts. Now by its nature the system can’t self-reflect directly on those values but is an abstraction of that process in the global ‘work space’ that effectively is created by the underlying operation. We can of course measure this ‘qualia’ of the system but the system can’t do it directly from its standpoint. In the research already done for ICOM we can see that ICOMTC system doesn’t really have free will but it would appear that way from the systems standpoint and experience the illusion of free will much the way humans do. In this case we are computing qualia by taking the sets that represent the current emotional landscape of the system and a conscious and subconscious level and computing the difference matching sets where a set is a plutchik model with 8 floating point values. We subtract the current state from the previous state giving us the plutchik representation of the subjective emotional differential experienced by the system. This really gives you the numbers in terms of ‘sets’ that show how a specific element of ‘context’ that managed to make it to the global work space is ‘experienced’ or rather the effective of that experience. We actually have to calculate this after the fact external to the system as it is not actually computed in the real process (noted in figure 1) and there is not a ‘direct’ method in ICOM to surface an objective measure of qualia to the system without a complete abstraction but we can compute it external and use it for analysis. Once again the over-riding need to measure the immeasurable raises it`s ugly head. Statistics are proof of ignorance. Numbers are not knowledge. It has been mooted that we are a mental construct that incorporates multiple persona in our subconscious and semi-conscious mind. Find the theory for yourself. I wont quote what you can find yourselves. If we are a construct, ever-changing, ever-evolving in complexity and moment-to-moment inner focus, and if, as it has been mooted, we have constant and endless conversation with these ever-changing inner mental persona, then it follows that without capturing that process in mid-flight (as it were) we can`t deduce the reasoning that results from these conversations. Therefore we are not able to quantify these processes in any way at all. It is ephemeral. Thought takes place in the interval between knowing and asking. Trying to build a machine that will think would take far more resources than mankind will ever possess. First, do you even accept the computational theory of mind? Then we don’t have a common frame of reference. Keep in mind this paper and the associated research is all published and peer-reviewed science AND is based on the assumption that the computational theory of mind is accurate more or less albeit we have baked out a much more complicated theory. That said our line of reasoning is based on Damasio’s work at a logical level, plus things like global workspace theory, integrated information theory and so forth. Fundamentally the assumption we are working from is that the human mind is nothing more than a software abstraction running on an OS on an electro-biochemical multi-threaded multi dual processing supercomputer and nothing more. IF you can’t prove this wrong empirically and are not willing to accept it then we have no frame to work from in any discussion. It just is not worth the effort to consider AGAIN these theories so we can focus on actual experimentation and solving the problem and proving it. If you’re going to argue that the computational theory of mind is not the right direction, I can accept that is valid and we can disagree but I would greatly appreciate being proven wrong. Then I can find something else to focus on.